How strongly would you recommend this cruise to another? Overall how smooth and comfortable was getting on the ship? All things considered, how would you rate the stateroom overall? Bars, youth facilities, WiFi, dining rooms, pools, how would you rate the features of the ship? Your dining room staff, stateroom attendant, customer service, spa staff, etc, how did they do? How would you rate the ports you visited, overall? The tours, trips and activities at ports. How were the shops, selection and prices aboard ship? Main Seatin, Open Seating, Walk-up, Snack Bars, how were they? The shows, special events, bands, dancing, games, how did they rate? You would rather stay, but when you had to leave, how was the process? What region did you sail to? Wester Caribbean, Europe, Alaska, Asia? If you don't have an exact date that is OK, just give us your best guess. How long was your cruise? Fly or drive to your cruise? Did you drive to you cruise or fly-in before? Give us a summary of your cruise experience. Remember you have lots of space and places to go into detail below! Tell us about your experiences in-port. How were the shops, people, sights? We also have a full section dedicated to Ports, shops and excursions if you want to review in even greater detail! Did you take any excursions ashore? Tell us about them! Were they line-affiliated or independant? Were they worth the price? Don't forget to check-out our Ports section to read and submit detailed reviews! Nobody wants to leave the ship. But tell us about it anyway! How was the Communiction *Organization *Customs Speed *Baggage Handling *Transportation from terminal *Etc. In January 2007 I took my first cruise in a few years after work and family had settled down. I choose Navigator of the Seas, which through friends I had the opportunity to know was being mastered by Captain Leif Otto Bang. His wife Darlene was aboard with him. The Voyager class is comprised of five ships. Navigator was the fourth unit built. Not only that Captain Bang had himself overseen her construction. She follows the same basic design all ships in her class share. However unlike the Voyager, Adventure and Explorer of the Seas, her balconies are hung outside of the main hull. This didn’t lead to any additional space within the ship but allows for more crew access. Navigator of the Seas departed out of Port Miami. I drove as is my habit and I found parking and embarkation little changed from Explorer of the Seas a few years prior. Sadly I didn’t have the service of my usual digital camera and learned the hard way that my 2006 model “smartphone” had a poor performing camera. I had the chance to connect with Darlene at a couple of receptions for different groups. A more traditional and gracious host I couldn’t describe. Shortly before the ship departed Ocho Rios I was given the opportunity to observe the process from the bridge itself. Watching the Captain and officers in action was highly impressive. After the ship was at sea the Bang’s played host in their cabin. I had the chance to share over an hour discussing everything from family to captain Bang’s career. It was already clear from the first few days aboard the ship that his crew held him in very high regard. From dining to the ship’s stores it seemed everybody knew him and had a good word to share about him. 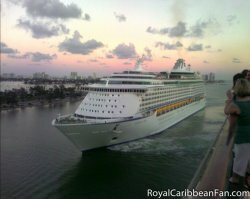 It was the first time on a ship that I could see how a captain makes a very real difference in the quality of a cruise. Taking the time to entertain somebody known to them only by friends was flattering and an honor. Likewise as somebody with a deep and keen interest in all things aboard ship the insights and time “behind the scenes” were memories I’ll keep a lifetime. I hope someday to be able to return the favor in some small way. The ship was without question the cleanest and most sharply kept I’ve sailed on before or since. The ship itself seems to carry a solid reputation even to this day and I would credit much of that to Captain Bang, from his oversight of the ship's construction to having set a high standard aboard her in her earliest days of operation. Disembarkation was improved over several years prior.